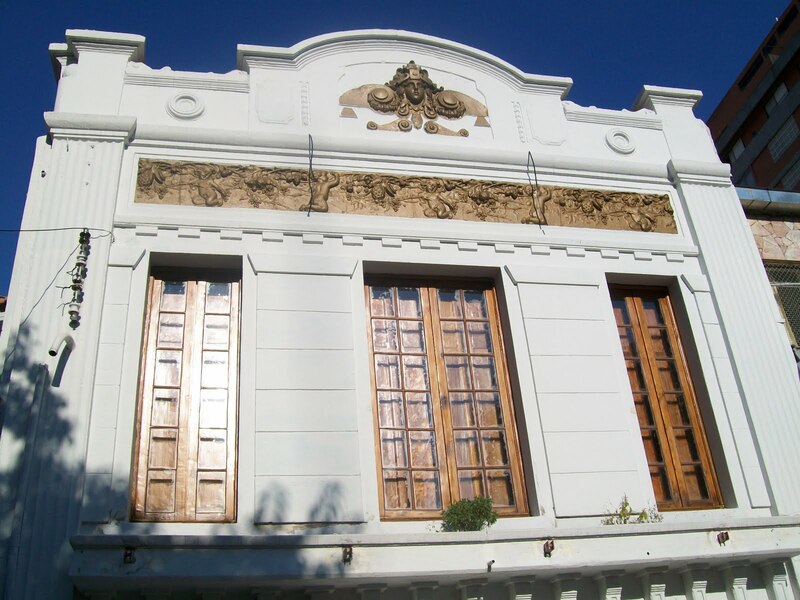 The Empanadas Bar was founded in 1980 by a Chilean and an Argentine. It was called Martin Fierro until the company finishes, ten years later. 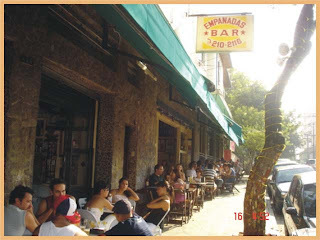 The Empanadas Bar in Vila Madalena is the best reference of São Paulo when it comes to empanadas. The bar has been a stronghold of leftist intellectuals, filmmakers discussed their projects on its tables, political and cultural revolutions were born and died on the same night, among the aromas of the empanadas fillings. Nowadays, the place became more eclectic, getting students from all corners of the city, athletes and neo-hippies. The flavors arebeef, chicken, chicken with cream cheese, cheese, palm hearts, cream cheese with pepperoni, spinach, dried meat and other options. 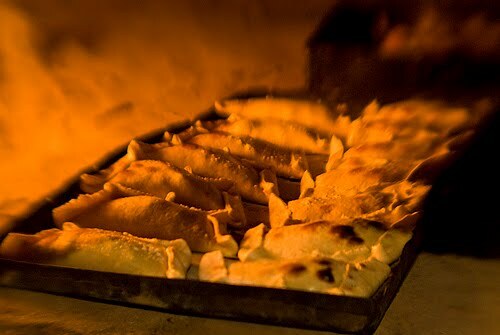 You can also ask a lot of smaller empanadas: a good option for those who want to know a little of what the house offers. Casa 92 is a mix of bar, restaurant and nightclub. In a residence of the Thirties, who was managed by the same owner for 60 years, a trio formed by Fernando Sommer, Caio Simões e Fernando Autran de Figueiredo called friends to create the decoration that would be a new concept of night club in Sao Paulo, with each giving its personal touch to a different room of the house. Every corner was decorated by artists like Pier Balestrieri, Nido Campolongo, Bia Guedes, Maricy Marcos, Rafael Renzo and Sofia Kozma, among others. In the kitchen, a menu is specially created by the Chef Danielle Dahoui, with dishes made primarily with potatoes, in homage to the region (known as Potatos' square). On the track, while the DJs play, wall projections of VJ Bia Guedes. The pub Armazem opens to the public today, Wednesday 26th. The new house will do promotions at the time of happy hour from 18h to 21h. After 21h, whoever wants to extend the night can enjoy the sound of bands and DJs. Every day of the week will be dedicated to a different rhythm. When subscribe at the club club you will get discounts on bottles of vodka and whiskey and you can store the bottle in a visible and custom closet to come back another day and finish drinking it. How Much: R$ 5 to R$ 20 for the entrance. 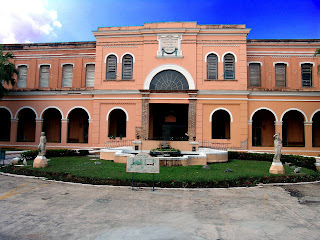 Casa Cor, the biggest events of architecture and decoration of Latin America. One of the biggest events of architecture and decoration began yesterday and will last till July 13th at the Jockey Club of São Paulo (west of the capital city). This year, 125 environments that indicate trends in architecture, decoration, design and landscaping are exposed. The novelty is that the event is divided into four thematic areas - Casa Cor São Paulo, Hotel, Kids and Talent House. All created from a basic idea: sustainability. Visitors can spend the whole day getting to know the surroundings of the Casa Cor. 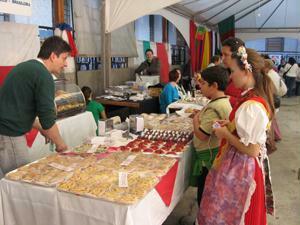 There are restaurants, delicatessen and tea to complete the program. On June 12th and 13th, a Special Sale will happen with the sale of objects and products that participated at the exhibition, with discounts of up to 70%. When: May 25th - July13th, from 12 pm 9.30 pm ( 8 pm on Sunday). Close on Monday. Tickets for the concert of the American band in Anhembi, on October 20th, has already started to be sold at the site www.livepass.com.br and also in addresses listed in the website or by calling (+55 11) 4003-1527 (from 9am to 9pm). 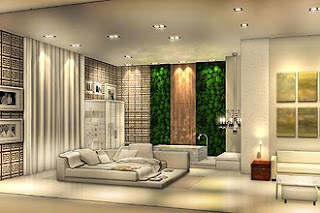 Prices range from R$ 180 (floor) and R$ 250 (premium lane spot). 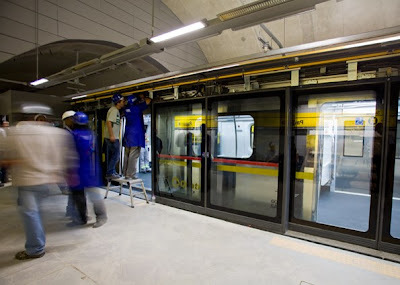 Today (May 25th) opens the first stretch of the Yellow Metro Line of Sao Paulo. For the moment it will connect the station Paulista on the Avenida Consolação with the station Faria Lima. Later the other stations will be open. When finished the new line will connect the center (Luz) to the west areas of the city (Vila Sonia). The Chef Fernando Carneiro is organizing during this winter, from May 20th , the 8th Festival of traditional soups of Minas Gerais, which comes with garlic toast, bread, cheese, pork rinds, couscous of dried meat and parsley. 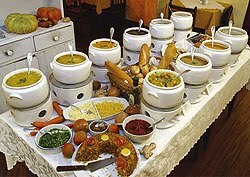 The buffet offers 12 choices of soups and creams. For R$ 21.90 you can try all of them. The restaurant has discovered the formula for success in serving simple, hearty recipes, always divisible for two people. 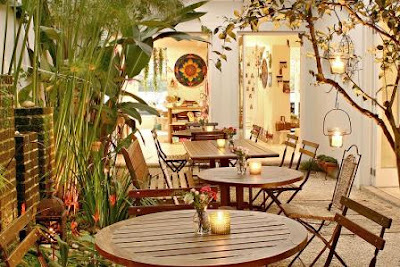 Besides the headquarters in the busy Praça Benedito Calixto, it maintains a quieter branch, also in Pinheiros. In both addresses, it presents classic recipes from the state of Minas Gerais. These pictures were published on the newspaper site o Estado de São Paulo. We chose some of them. Have a look. 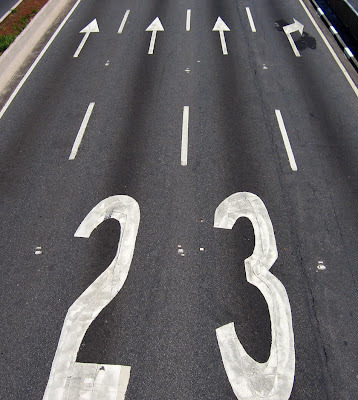 They all are about the Avenida 23 de Maio, which connect the center of the city with the south region. Dance groups representing 19 countries will be this year at the 15th Immigrant Festival that happens in the Immigrant Memorial (east of Sao Paulo), on Sunday 23d and 30th. The event attracted 16,500 people last year. The public will have the opportunity to watch presentations of dances and folk songs of the groups formed by immigrants and descendants of Bulgarians, Portuguese, Lithuanian, Russian, Japanese, Italian, Irish, Lebanese, Indian, Chinese, Spanish, African, Ukrainians and others. In two days, the Memorial will be full of presentations of dances and ethnic music, craft fair and typical food from all these countries. The public can also visit the exhibition of the Museum of Immigration. How Much: From R$2.50 to R$ 5, free for children under 7 and people over 60. The stations Tamanduateí and Vila Prudente, of the Green Line 2 and Paulista and Faria Lima stations of the Yellow Line 4 should be opened until the end of next month. The information is from the Assessoria de Imprensa da Companhia do Metropolitano de São Paulo (Metrô) (Press Office of the Subway Company of São Paulo - Metro), although they have no set yet a day of delivery. Following the release of security protocols, the stations should be open to the public in times that are not of peak movement. In the case of Line 4, this has already been set: from 9am to 3pm. Further, the times will increase. This is a standard procedure. Since early last year, were announced several delivery of the section between stations Paulista and Faria Lima. 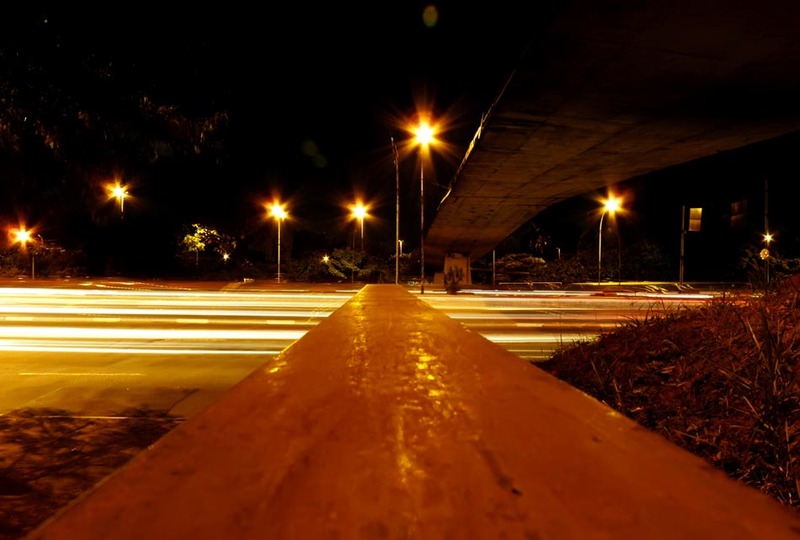 At first, the plan was to open in March, in the last days of the then Governor Jose Serra (PSDB) in office, but the deadline was postponed to April, and now up to the end of June. The delay, according to the Press office of the company, is attributed to a "rigid testing protocol." Eight shoppign centers, 25 cafes and bars, 23 nightclubs, 20 restaurants and eight saunas. 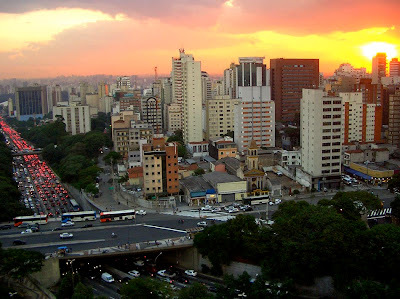 The São Paulo Turismo (SPTuris) listed 91 gay friendly places, not to mention the indications of parks and museums. The reportwill be disclosed at the Gay Tourist Information Centre (CIT), which starts working today at Rua Frei Caneca. The idea, according to the SPTuris, is to publicize the city's options for the gay community, coming to Sao Paulo with more intensity in the Gay Pride parade, but that come back on other occasions. This year the parade will be on June 6th. 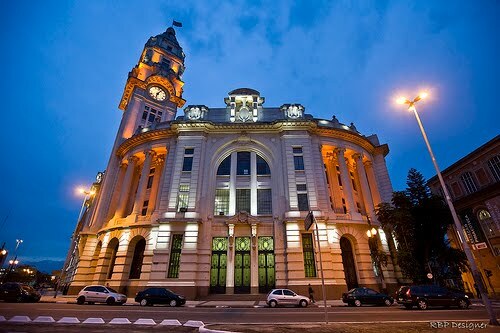 With trained staff the Gay CIT will work in Casarão Brasil, GLS association , and will be administered by the Associação Brasileira de Turismo para Gays, Lésbicas e Simpatizantes (Abrat-GLS). The staff is bilingual (Portuguese and English) and trained to guide the safest way to explain how the nightclubs or restaurantx work. 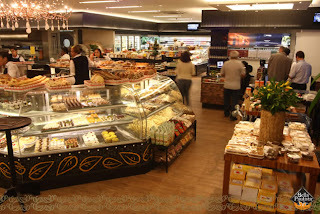 This is a new concept of bakery, there are some of them in Sao Paulo and this one can be considered one of the best. Far beyond a simple coffee and French bread, it provides an environment where you can feel very comfortable because it is a bakery, which merged with restaurant, snack bar, pizzeria, bar. 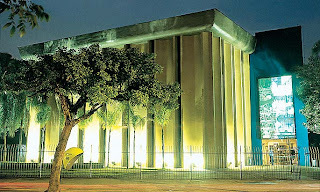 From May 17th to 22nd there will be many events about sustainability at the Livraria Cultura in the Avenida Paulista. The issues discussed in the workshop will be about education and sustainability, climate change forum, sustainable tourism and architecture. Besides that many books about the issue will be sold and objects produced by ONGs committed to sustainability too. When: May 17th to 22nd, from 9 am to 10 pm. August 17th will be the day which Via Funchal will present the first of four concerts of the Simple Minds tour in Brazil. The Scottish band will also play in Rio on the (19th) at Vivo Rio, Brasilia (21st) and Porto Alegre (22nd). The group led by singer Jim Kerr rehearses his return to Brazil since last year after he already postponed twice the trip. The tour promotes the album Graffiti Soul (2009). 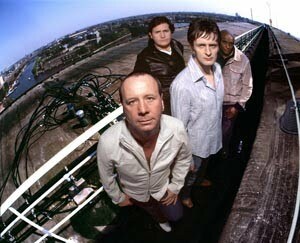 The Simple Minds became famous during the 80's through the hits "(Do not You) Forget About Me" and "Alive and Kickin". The 14th edition of the Cultura Inglesa Festival brings together, in the Brazilian British Centre and English Culture Auditorium, several films, plays, exhibitions and works inspired by British artists. Shows take place until Sunday 23d of May. This is a unique format opened in 2004 in which British culture is interpreted and recreated by Brazilian artists. With the sponsorship of English Culture, the projects chosen by a curator of renowned journalists, scholars and artists from various areas become 15 attractions specially produced for the festival. Check out the program for the next days. Acclaimed by audiences and critics, the Bridgestone Music Festival returns this year for its third edition to combine different genres of contemporary black music. Those who followed the first two editions of the crowded festival, already knows that this festival is certainty of attractions and high-level musical. Ahmad Jamal, The Overtone Quartet, Christian McBride, Melissa Walker, Uri Caine, Barbara Walker, Dee Alexander, Don Byron, Christian Scott and Daniel Piazzolla among others are the attractions of the event. Choose the day you would like to go and enjoy it. 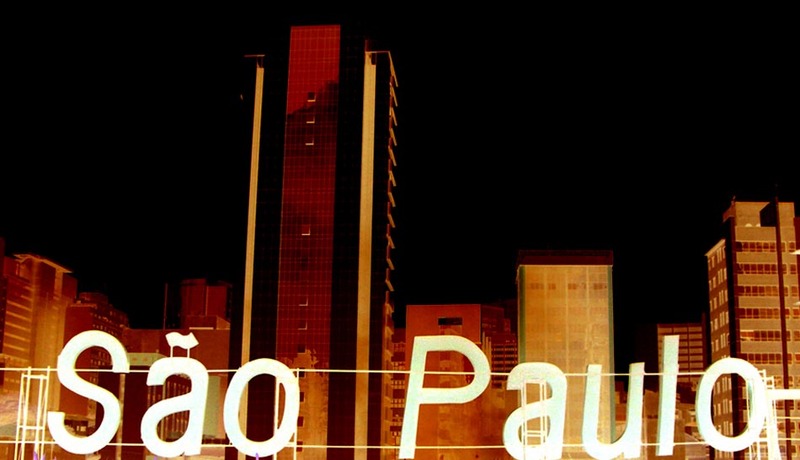 The 24 hours no stop of cultural event inside Sao Paulo will give us many options to have fun, enjoy good music, visit the museum we never had time to know and walk around the city center. The program is huge, we already gave you some info but here some more things to know about the Virada Cultural 2010. There will be a train of CPTM going from Luz station to Bras station where there will be played music of Adoniran Barbosa,one of the most important samba composer of the city. In the praça Ramos there will be a Chopin Voador (Flying Chopin), the public will see the performance of Ricardo Perez & Collective Giant playing Chopin on a piano hanging in the air. The Anhangabau valley will be invaded by giant insects, led by members of the Spanish group Sarruga. The best 10 pastel producer will be selling during the Virada, have a look on the post we wrote about that competition. 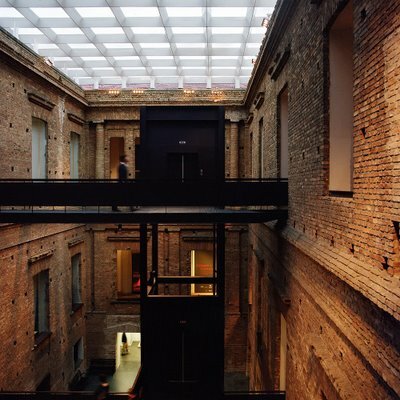 In the Galeria Prestes Maia there will be a space dedicated to tattoo artists and presentations of body suspension, in which artists are hung on hooks passed through the skin. The praça Roosvelt will have events related to the "nerd" universe such as cosplay parades (costumes of Japanese pop culture), role-playing games and toy art exhibition. We are sure you'll find what suits you best. Enjoy it! 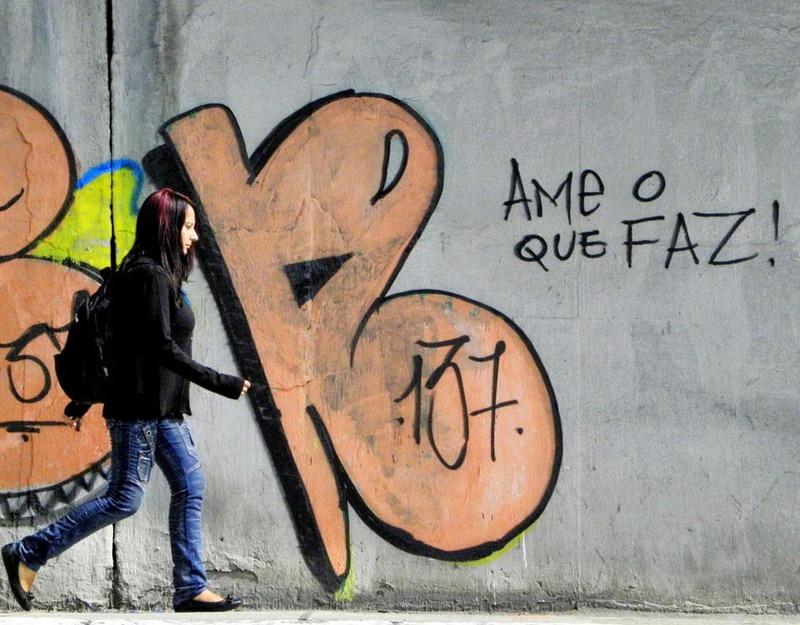 Today, May 13th, it is the anniversary of slavery abolishing in Brazil. The event happened 122 years ago. 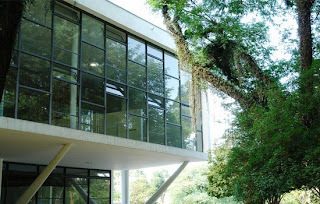 To remind this date, the Museu Afro located in the Parque Ibirapuera will host an exposition on the topic organized by Emanoel Araujo. The show features two different times, showing historical documents, historical photographs, watercolors, paintings, publications and sculptures on black abolitionists icons. When: From tuesday to sunday, from 9 am to 5pm until June 16th. 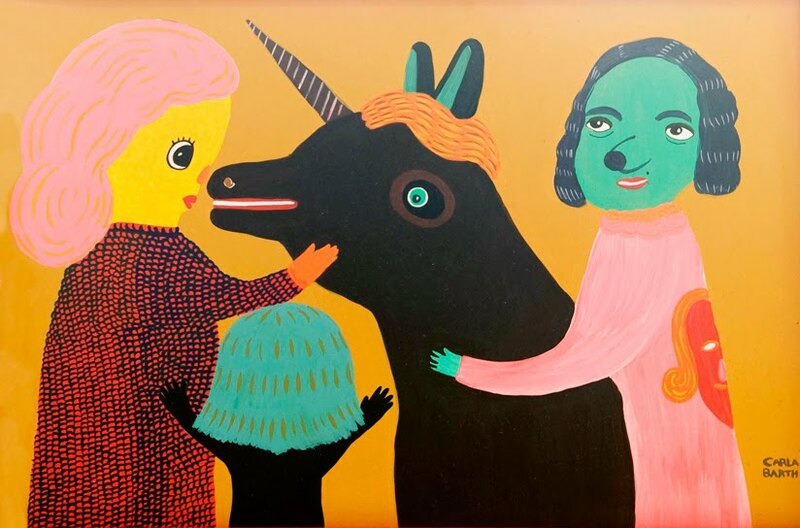 The artist Carla Barth from Porto Alegre, South of Brazil, who likes to portray fantastic places with bizarre characters, always drawning from some kind of fairy tale or urban legend, this time goes deeper into the Naïf Pop universe. The screens inside the expo "Estranhos" (Strange), brings scenes with surreal and enigmatic environment, painted by a dull color and precise strokes. When: Tuesday to Saturday, from 1pm to 6pm. The exhibition ends on June 5th. Green Day, one of the main exponents of punk rock genre in the world, confirmed their tour in October in Brazil. The group will present their new album in the following capitals: Porto Alegre, Rio de Janeiro, Brasilia and Sao Paulo. Tickets for the concert in Sao Paulo, will go on sale on May 25th and will cost from R$ 180 to R$ 250. 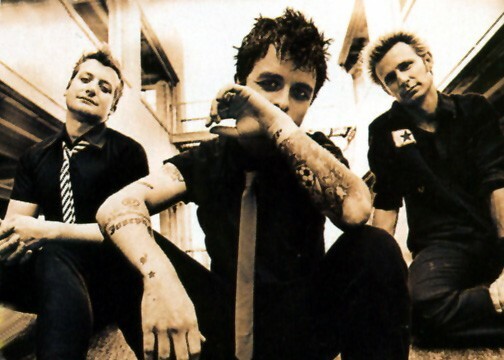 With a 20-year career, Green Day sold about 25 million albums worldwide and won four Grammys. 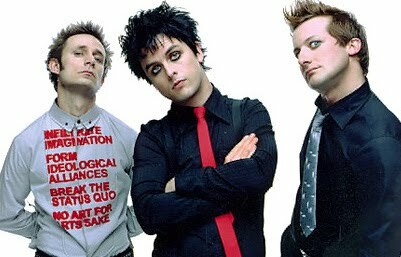 Formed by singer-guitarist Billie Joe Armstrong, bassist Mike Dirnt and drummer Tre Cool, the band has already released 10 albums. The last one, the 21st Century Breakdown, has won the Grammy for Best Rock Album and three statuettes at the last MTV Video Music Awards. In Sao Paulo the show will be October 20th at the Arena Anhembi, but we'll keep you update with more info. The legendary band The Mothers of Invention, led by Frank Zappa in the 60s, opens the stage. Born in 2002, due to an invitation to honor Frank Zappa in Germany - with whom he played in former Mothers of Invention - the new band Grand Mothers - Re: Invented consists of five members: Don Preston (vocals, piano and vocals, piano and synth), Napoleon Murphy Brock (vocals, saxophone, flute), Roy Estrada (vocals, bass), Miroslav Tadic (guitar) and Chris Garcia (drums). With new songs, the group will make a great show playing their great successes of old albums as "Freak Out! ", 1966. After will be the time of Janis Joplin. "Summertime" and "Piece of My Heart" are guaranteed! 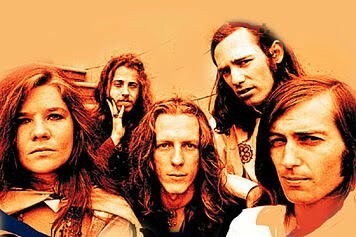 Big Brother & The Holding Company, the first band to record and tour with Joplin, promises to make a show worthy of the old days. The band was born in 1965 and had, in its original form, Sam Andrew (guitar), James Gurley (rhythm guitar), Peter Albin (bass) and Chuck Jones (drums). The group's popularity increased with the addition of the singer Janis Joplin. However, at the end of 1968, Janis left Big Brother to assemble a new band - The Kozmic Blues Band. On the same stage Patrulha do Espaço, L.A.Guns, Velhas Virgens, Krisiun, Imbyra, Pitty, CPM 22 – Só Ramones, Raimundos, Arnaldo Antunes e Titãs - in that order will play. The square (Praça Julio Prestes), located in the center of São Paulo is a kind of summary of the diversity of the event, receiving national and international artists and music groups. Just to remind some of the international names, the event will be open by Barbarito Torres and Ignacio Mazacote, ex musicians of the Cuban band Buena Vista Social Club and host the show of Abba. 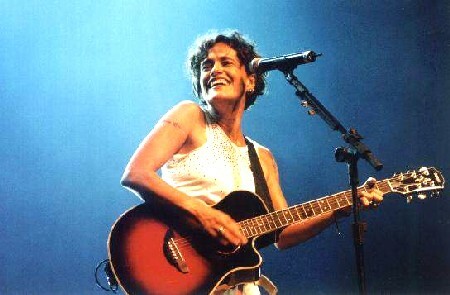 For the national side many great musicians and bands like Zelia Duncan, Toquinho and Céu among others. This year, the Sao Paulo Transport (SPTrans) created a special line of buses to help those who want to enjoy the activities offered by the Virada Cultural. 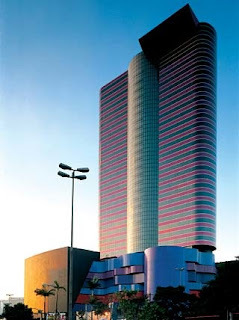 The circular line 2001/10 Terminal Bandeira / Terminal Princesa Isabel /Amaral Gurgel and Parque Dom Pedro II, will operate without interruption from 4 pm of Saturday, May 15 th until midnight of Sunday, April 16th. 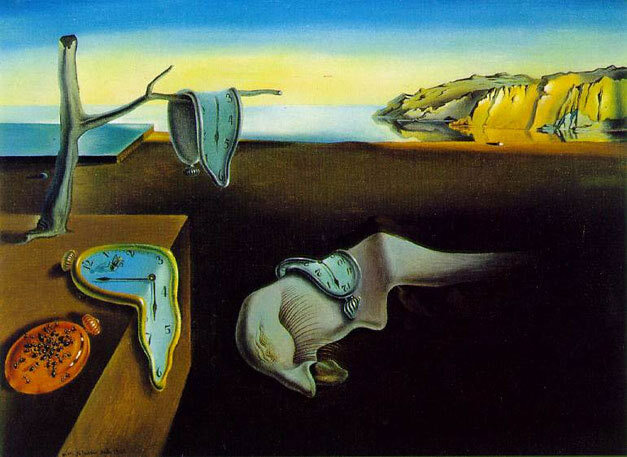 The circuit was set in order to pass through the points where the concentration of activities and shows will be. The line includes six buses, all accessible, which will depart every 10 minutes. Those who choose to use the special line will be surprised by cultural presentations held within the bus. Among them circus, stand up comedy, workshop with puppets, musical performances and storytellers. To encourage people to use public transport, the SPTrans decided to anticipate the time of ticket Amigão (Buddy ticket), that can be use from 4pm ofSaturday until the midnight of Sunday. You can make up to four integrations in a period of eight hours, only paying R$ 2.70. 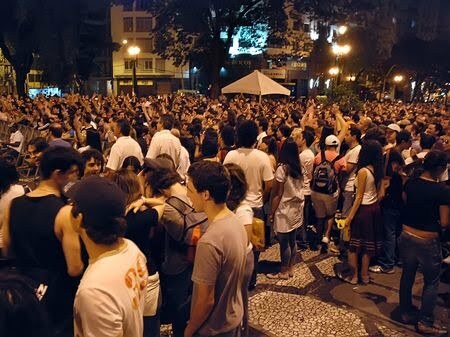 In the last edition of the Virada Cultural, 400 000 people used the Ticket Amigãoduring the event. For this year, the SPTrans estimates that half a million users will use it. 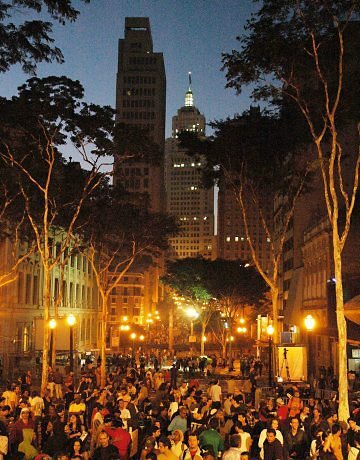 Like every year, Sao Paulo organizes a week end full of cultural events for free in different places of the city and we will keep you updated with all the informations you need to enjoy at best this fantastic event. 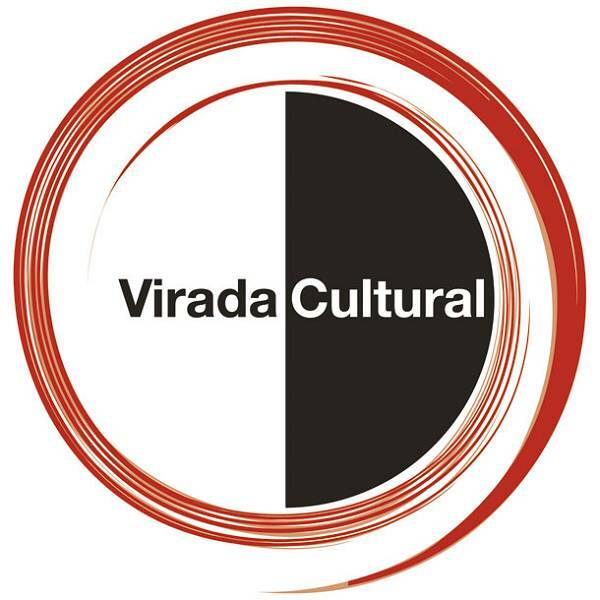 The Virada will be this week end, May 15th and 16th and there will be both national and international artists. 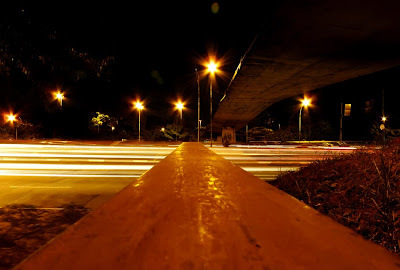 Wait for the right moment to shoot. No hurry and acting sure. This seems to be the keynote of photographer Steve McCurry, who come to Sao Paulo with the invitation of SP Photo Fest and of the magazine Fotografe Melhor for workshops and lectures at the Museum of Image and Sound (MIS), between May 20th and 23d. It is also planned an exposition at the Galeria Babel, curated by Eder Chiodetto and Jully Fernandes. McCurry that was already present in the greatest conflicts of the world, has become known in the 1980s when shooting an Afghan girl, Gula. 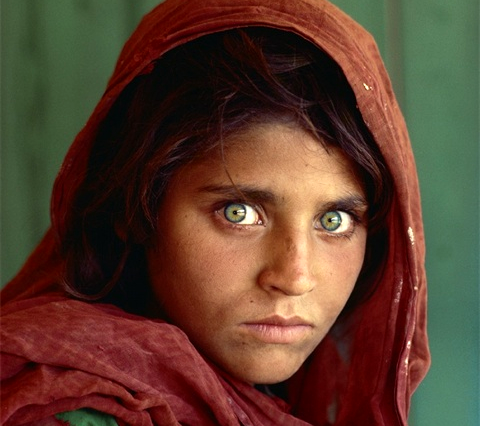 Those green eyes made the trip around the world on the cover of National Geographic. His photos also bring us the conflicts in places like Iraq, the former Yugoslavia, Lebanon and of course Afghanistan. In Afghanistan, his career as a photojournalist began to be recognized. Dressed in local clothes, crossed the border with Pakistan after the Soviet invasion in late 1979. He published the first images of the conflict. He also stayed in India,Tibet, Burma and photographing the temples of Angkor Wat, as well as the attack on the Twin Towers in the United States in 2001. 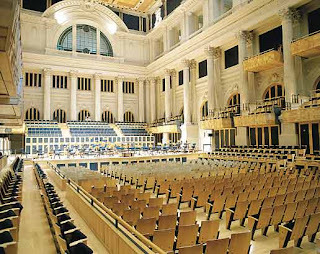 Symphonic State Band of Sao Paulo. Concert this Sunday! 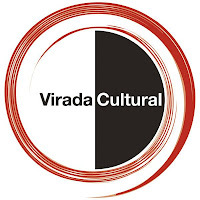 Intelligent and creative alternative to the traditional circuit of classical music, the Banda Sinfônica do Estado de SP (Symphonic State Band of São Paulo) was founded in 1989 and nowadays is considered responsible for the contemporary creation in Brazil. The Symphonic Band starts the Série Assinaturas 2010 concert with Scheherazade, of Nikolai Rimsky-Korsakov, inspired by the Persian literary classic The Thousand and One Nights. 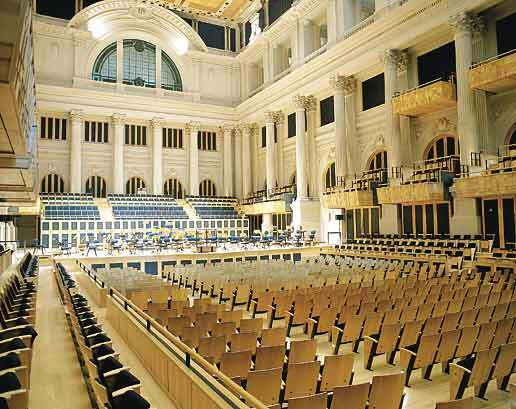 The last concert of the series, which also has the Spanish Rafael Sanz-Espert and the Hungarian Laszlo Marosi, among others, is scheduled for November and plenty of good music will be played during next months! When: May 9th, at 5pm. Walking tour introduces the Street art of SÃO PAULO. Come to enjoy it! There are many stories behind the colorful walls around the city! It's necessary to get close to understand the poetry. Surely you would enjoy it! Some people may say it is vandalism, but the vast majority faces as artistic expression. The Graffiti has already cemented its place as a urban culture, especially into São Paulo´s culture. 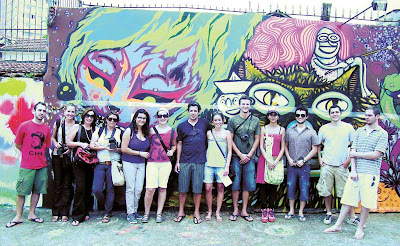 The Street Art Walk leads you to its colorful universe, recognized by many as one of the most important artistic expressions of the 21st century. It's possible to pass by incredible alleys and old school stores inside the neighborhood of Vila Madalena, and indulge in art, graffiti art, as if you were in a street museum. 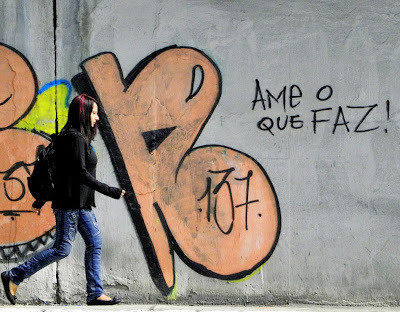 This Street Art Walk organized by Soul Sampa was made for those interested in a different side of São Paulo and also for all graffiti & street art lovers. 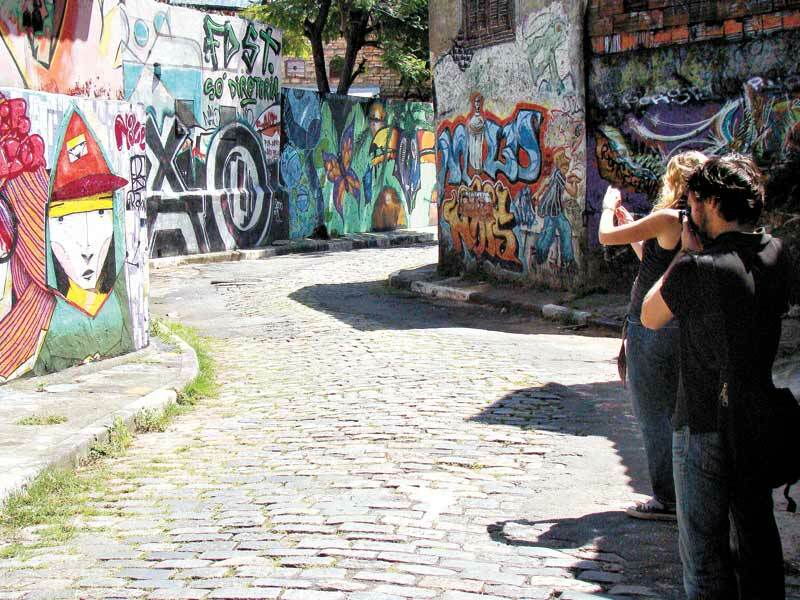 Soul Sampa is offering through the insidesaopaulo, a special discount for this Saturday (May 8th): Street Art Walk for R$50 each (30% off)! 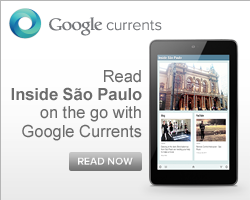 You can join the walk sending an email to streetart@soulsampa.com saying you’re an insidesaopaulo reader! It’s a great opportunity to get out of the online world and meet many other people. Come up! The last Kittin album, entitled Batbox, was released in 2008. But the last album with a partner The Hacker, Two, was launched in March last year. Influenced by the sound of electro and 80's, Miss Kittin began acting in the electronic scene in 1991, becoming one of the main protagonists of the so-called electroclash. The Tomie Ohtake Institute, building of one of the most important Latin American city, São Paulo, presents new trends in national and international art with references for the last 50 years, coinciding with the period of work of the artist who gives name to space, Tomie Ohtake. It has 7500 m2 for art, architecture and design exhibitions, specific rooms for workshops, seminars and documentation, restaurant, bookstore and gift shop and it is planning over 6500 m2 under construction for two theaters and a cinema. Tomie Ohtake is considered the "queen of the Brazilian plastic arts " thanks to her careers, built over the last fifty years, and for her unique style to face work and life. The fame she achieved, since the Sixties, never changed her challenge: the eternal reinvent. You can find at the moment three interesting expositions, but keep yourself update on the website to follow the rich program for the next exhibitions. São Paulo may get, between the end of this year and early next year, an exhibition of the Spanish artist Salvador Dali. Who confirms the information is the spokesperson for the Instituto Tomie Othake. The premiere date is under negotiation, according to the entity. Let's wait for more informations. Teatro São Pedro has chosen "Tosca", the work of the Italian composer Giacomo Puccini, to open its 2010 season last Thursday 29th. 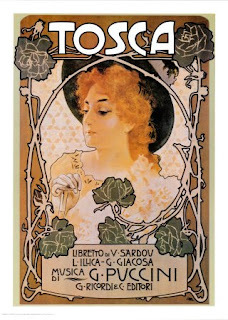 In the theater until May 8, the group presents the story of Tosca, an opera singer in Rome who finds herself caught between obeying the chief of police or seeing her lover, the painter and revolutionary Mario Cavaradossi, who will be tortured and killed. It is a good way for people who are not use to this kind of art, to get to know a bit more about Opera. While for lovers of Opera, this is a classic that can't be missed. 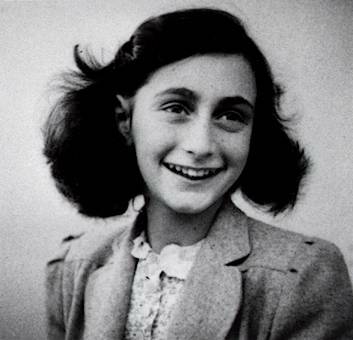 The exhibition, organized by the Anne Frank House, has passed in 50 countries already since 1996 (among them Japan, Germany, Great Britain, France, Belgium, Netherlands, Poland, Italy, Spain, Portugal, New Zealand, Ecuador, Panama and the United States ). In Brazil, "Anne Frank, uma historia para hoje" is under the coordination of WZM Platforma Brasil Holanda, official representative of the Anne Frank House in Latin America. It is composed of 30 panels with documents, texts, letters and photographs and is guiding the visitor through the Frank family ordeal under the Nazi dictature, reflecting especially the girl's life, Anna wrote a diary until being caught by the Gestapo, it was published in 1947 and let people know about the horrors perpetrated against Jews in World War II.